The first privately built Cygnus spacecraft built by Orbital Sciences Corp. is released from the International Space Station's robotic arm on Oct. 22, 2013 to end its first test flight to the station. The first privately built Cygnus cargo ship to visit the International Space Station detached from the orbiting lab Tuesday (Oct. 22) and is poised to destroy itself in Earth's atmosphere in a fiery finale to its successful test flight. 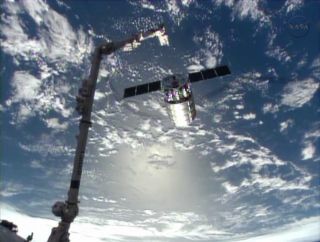 The unmanned Cygnus spacecraft built by Orbital Sciences Corp. of Dulles, Va., was released by astronauts using the station's robotic arm at 7:30 a.m. EDT (1130 GMT) as both space vehicles sailed high above the Atlantic Ocean, east of Argentina. The spacecraft is expected to fire its rocket thrusters Wednesday (Oct. 23) to leave orbit and burn up in Earth's atmosphere. "It was a real pleasure to work both with Cygnus and all the people on the ground," Parmitano radioed NASA's Mission Control in Houston. The departure of Cygnus caps a successful test flight of the new spacecraft by Orbital and sets the stage for the first official cargo delivery to the space station in December. Orbital Sciences has a $1.9 billion contract with NASA to deliver supplies to the space station with at least eight Cygnus spacecraft. The next Cygnus spacecraft is expected to launch to the space station in December to fly Orbital's first official cargo delivery mission for NASA. This first Cygnus launched toward the space station on Sept. 18 atop an Orbital-built Antares rocket from NASA's Wallops Flight Facility on Wallops Island, Va. The spacecraft arrived at the station on Sept. 29, about seven days later than planned due to a software glitch and the launch of a new crew to the orbiting lab on Sept. 25. Orbital's disposable Cygnus spacecraft are silver cylinders about 17 feet (5 meters) long that are built for the company by Thales Alenia Space in Italy. Cygnus is powered by an Orbital-built service module containing two solar wings for power, as well as rocket thrusters. Each Cygnus is capable of carrying up to 4,409 pounds (2,000 kg) of supplies, though the first test vehicle was packed with only 1,543 pounds (700 kilograms) of supplies and gear, Orbital officials said. Orbital Sciences is one of two commercial companies with billion-dollar NASA contracts to keep the space station stocked with supplies. The other company is the Hawthorne, Calif.-based SpaceX, founded by billionaire Elon Musk, which has a $1.6 billion to fly 12 cargo flights to the station using its Falcon 9 rocket and Dragon space capsules. SpaceX has already flown two of its 12 cargo flights, which launch from a pad at the Cape Canaveral Air Force Station in Florida. Unlike Cygnus, SpaceX's Dragon capsule is equipped with a heat shield and can return supplies and experiments back to Earth. "Congratulations to the teams at Orbital Sciences and NASA who worked hard to make this demonstration mission to the International Space Station an overwhelming success," NASA Administrator Charles Bolden said in a statement. "We are delighted to now have two American companies able to resupply the station. U.S. innovation and inspiration have once again shown their great strength in the design and operation of a new generation of vehicles to carry cargo to our laboratory in space. Orbital's success today is helping make NASA's future exploration to farther destinations possible." With the retirement of NASA's space shuttle fleet in 2011, the space agency is relying on Orbital Sciences and SpaceX to deliver vital supplies to the station crew. NASA is also banking on new crew-carrying commercial spacecraft to ferry American astronauts to and from the space station. SpaceX is one of several companies vying for NASA's commercial crew flights. NASA first picked Orbital Sciences as an International Space Station cargo partner in 2008 when the agency awarded the company $288 million to develop Cygnus. Orbital named its first Cygnus spacecraft the G. David Low a former NASA astronaut who oversaw Orbital's bids for NASA contracts. Low died of cancer in 2008. "It's been really great mission," NASA astronaut Cady Coleman radioed the station crew from Mission Control, "and we're both sad and happy to say goodbye to the G. David Low today," NASA astronaut Cady Coleman radioed the station crew from Mission Control."